Back in the Southern California Wasteland again. I was an unpacking ninja and had everything put away and back to normal in less than 30 minutes. Made it much easier to readjust after being gone over a month. I wanted to make sure I didn't use the long drive as an excuse to be lazy once I got home, so I've made sure to stay busy. And not just by catching up on 90210 (there's over 60 episodes on the DVR). Mainly, I've been working on the site redesign. I'm thinking there's a 36% chance it's done by the end of the month. I've been putting off working on the graphical elements because that's definitely not my strong suit. Luckily for me, there's tons of other stuff that needs to be done. 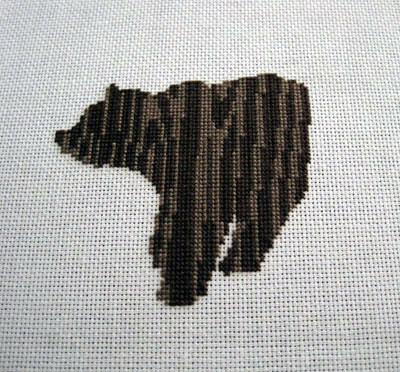 I've also finally gotten back to working on the woodgrain bear. I feel stupid for taking so long to start working on it again. The mistake I made was 1 stitch and not a big deal at all. My goal is for him to be finished by next week. Yesterday I received my book swap piece. 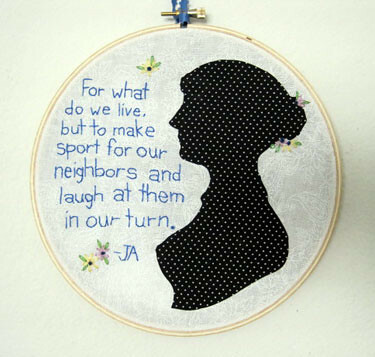 I mentioned to my partner *ennairam that Jane Austen was my favorite author and she embroidered this great quote from Pride and Prejudice for me.